Your new piglet will be very scared! So be understanding. Keep your piglet feeling secure, wrap in a towel and nurse him, talking softly and patting him. He needs to get used to your touch and the sound of your voice. At first your piglet won’t take to the bottle, it will squeal and wiggle trying to get away. You will need to wrap your piglet in a towel and hold him under your arm, with the other hand pry open his mouth (watch for sharp teeth!) Insert the teat, and clasp fingers around snout so the teat is in mouth. The piglet will be squealing so be sure not to squirt the milk into the airway! Once piglet has stopped squealing, he will hold the teat in his mouth; slightly apply pressure to the bottle to allow milk to drip slowly into the piglet’s mouth so it gets a taste. (This will probably have to be done a few times till it gets hungry and accepts the bottle) Be persistent!! You will definitely know when he’s taken the bottle, a very obvious sucking look on his face. The piglet will drink quickly and for short bursts, He will stop drinking when he is full, and may fall asleep with the teat in his mouth! This needs to be done at least 5 times a day. You will know when he’s hungry when you hear a high pitched squeaking sound! If your piglet is less than 3 weeks old he will need to be kept warm! A young piglet can’t hold his own body temperature, use of a hot water bottle or heat pad is necessary to aid with sleeping. Don’t let your piglet catch a chill as death will soon be apparent. Your piglet will start to nibble on hard food at 5 weeks, nosing the ground and wanting to eat fruit, vegetables and bread. You may like to feed a rabbit grain mix, this would be fine for a growing piglet. Keep in mind that the more protein you feed the bigger the piglet will grow. Weetbix & milk is a winner!! You should worm your piglet at 6 weeks and every 3 months there-after with ‘Piperzine’- Chicken & Pig wormer. Get this from your local feed store. You may want to get a temporary nose ring for your piglet to prevent digging; this can be done at 5 weeks. And a permanent nose ring at 5 months. Piglets make great pets, Indoors or out!! 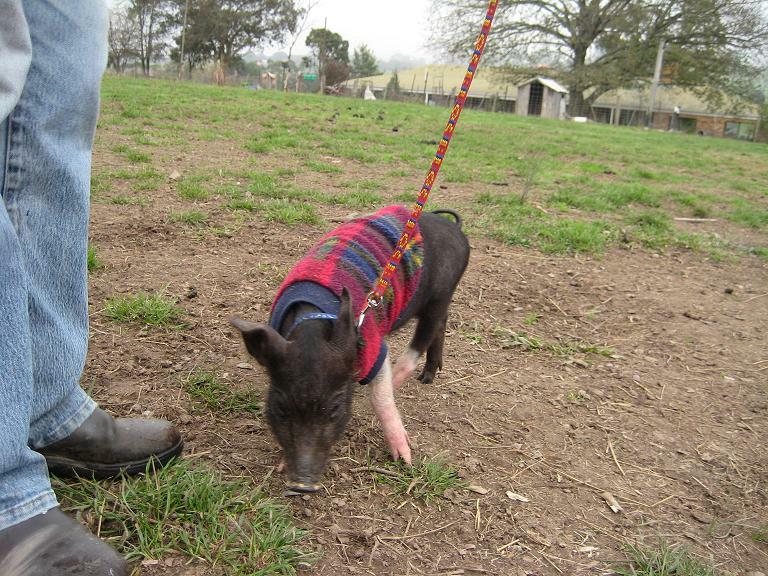 Train your piglet to walk on a harness and hunt truffles!! Winki - A runt we raised. 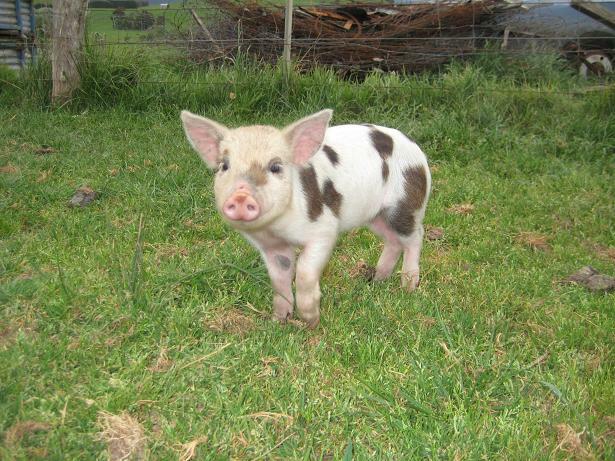 I am able to Nose Ring your piglets - under 6 months old prefered. **Prices Vary.